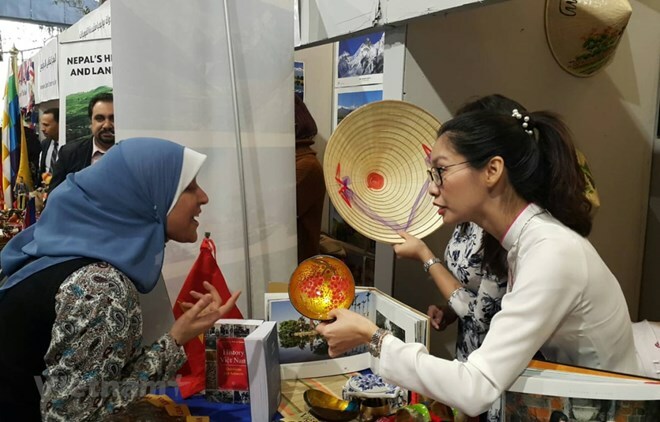 Cairo (VNA) - Vietnam left strong impression on visitors at the 16th Sakia Exhibition for Cultural Services, which opened at the El Sawy Culturewheel Centre in the Egyptian capital city of Cairo on February 27. The two-day event drew the participation of numerous countries and territories across the world. The Vietnamese Embassy in Egypt introduced many documents, books, photos and objects on culture, history, the land and the people of Vietnam, especially its outstanding achievements. Besides books on tourism introducing attractive destinations and unique features of regions, there also were magazines, photos, maps and documents and documentary screenings on Vietnam and the country’s specialities of fried spring rolls and coffee. In an interview with the Vietnam News Agency, Ambassador Tran Thanh Cong said the annual festival presents an opportunity for foreign diplomatic agencies in Egypt to promote the image of their respective countries in different fields, including politics, diplomacy, socio-economics and culture. The exhibits at Vietnam’s booth attached crowds of visitors. Safeya, an Egyptian visitor expressed her impression on Vietnamese traditional culture, saying the event helps her understand more about the country and its hospitable people. Many others also showed their interest in Vietnam’s traditional long dress (ao dai) and handicraft products.